On Dec. 15, the GenerationS startup competition announced its winners. More than 2,500 projects from 14 countries were considered, and the total value of prizes exceeded $2.2 million. 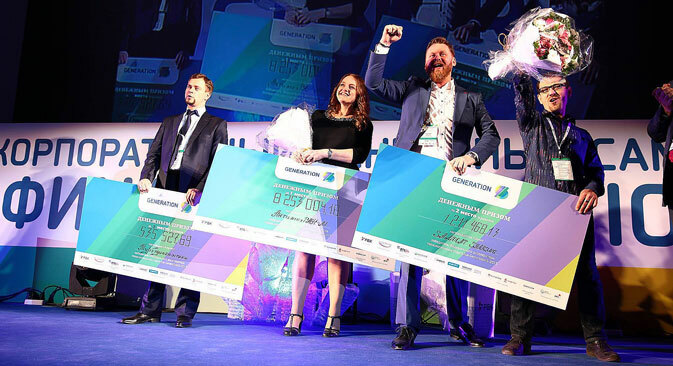 The GenerationS competition, organized in Moscow by the Russian Venture Company (RVC), ended with 35 startups receiving investments of more than $2.2 million from more than 150 of the project's partners. These included foreign and Russian companies such as SAP, IBM, Samsung, Microsoft, Johnson&Johnson, Sberbank-Technology, NPO Saturn, and many others. The approximate $142,000 in grand prize money was shared by three winners. First place went to the AntionkoRAN-M anti-tumor drug that has worked effectively against head and neck cancer, as well as cervical cancer. The Samocat Sharing System, a new concept for renting scooters with cloud technology, came in second. Next year, Samocat will be launched in Moscow, Paris, and Brussels. The bronze medal went to Turbo-diagnostica that makes a software used to check the condition of turbo blades during use. "This year, GenerationS was made possible thanks to close cooperation with Russia's largest corporations, which directly participated in selecting, examining and accelerating projects based on their needs for innovative developments," said Gulnara Bikkulova, Director of GenerationS, and a RVC board member. "The GenerationS-2015 competition gathered a record number of applicants: 2,566 projects from 14 countries. And 141 startups selected based on the results of a multi-stage examination were able to benefit from an intensive study program in the corporate accelerators."